Holidays are a time for family and friends to gather for mouthwatering meals, but catering to every guest's dietary requirements can be a challenge. The menus in The Healthy Hedonist Holidays will entice every guest -- vegetarian, semi-vegetarian, carnivores, omnivores who can't eat dairy, and people who just love good food -- with delicious, satisfying flexitarian"" meals. Featuring fresh seasonal ingredients, whole grains, natural sugars, and creative seasonings, these flavorful feasts will leave guests feeling satisfied -- without the guilt that usually accompanies holiday indulgence. Each menu offers both a vegetarian and fish or poultry main course, and a range of side dishes, appetizers, and desserts that can be used in any combination to accommodate individual tastes. Myra Kornfeld's recipes honor America's diverse cultural and ethnic heritage. Even if you're not of Chinese descent, sit down to Sesame Noodles with Wilted Nappa Cabbage and Crispy Five-Spice Tofu with Black Bean Sauce. The traditional flavors of Thanksgiving take on a southwestern flair with a maple sugar-brined turkey accompanied by Mole Gravy with Dried Plums and Ancho Chiles. The Feast of Eid al Fitr explores the flavors of Turkey and Morocco with Chicken Breasts Stuffed with Onions, Cinnamon, Almonds, and Cherries, and Semolina Walnut Cake with Macerated Oranges. A Passover dinner offers herb-flecked matzo balls in a vibrant green spinach soup and a fish terrine studded with asparagus. Christmas dinner turns to the shores of Italy for inspiration with Flounder Roll-ups with Pistachio Pesto and Squash-Portobello Lasagna. 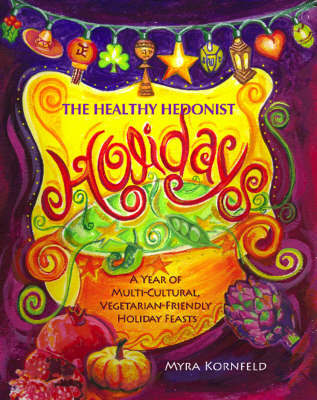 With sections on ingredients, techniques, and a cooking plan for each menu, The Healthy Hedonist Holidays is a book to use, to give, and to savor, over and over again.